When it comes to food, I can’t think of a country that does it better than bella Italia. From the pasta, pizza, and arancini, to all the gelato and tiramisu, limoncello and vino, we always make it our mission to eat and drink everything in sight. And we usually take a few cooking classes, too! During our latest trip to Florence, we took *a cooking class where we learned how to make this authentic homemade pasta recipe we’re about to share! After spending weeks in Italy, spoiling ourselves with countless plates of ridiculously delicious, fresh pasta, it’s hard to go back to the store-bought kind. There’s simply nothing like homemade pasta. So without further ado, here’s the authentic homemade pasta recipe we learned to make in Italy! In order to make this authentic homemade pasta recipe, you’ll need four ingredients: extra virgin olive oil, eggs, salt, and flour. Note, however, that you can’t use any flour. You need a specific type of very soft, very fine flour, also known as “00” flour. It can be difficult to find “00” flour in the grocery store, so we recommend that you buy this “00” flour online! Also, keep in mind that this type of flour is ideal for making Neapolitan-style pizza (we’ll do another blog post on this sometime soon). In Italy, we learned how to make this authentic homemade pasta recipe by hand. 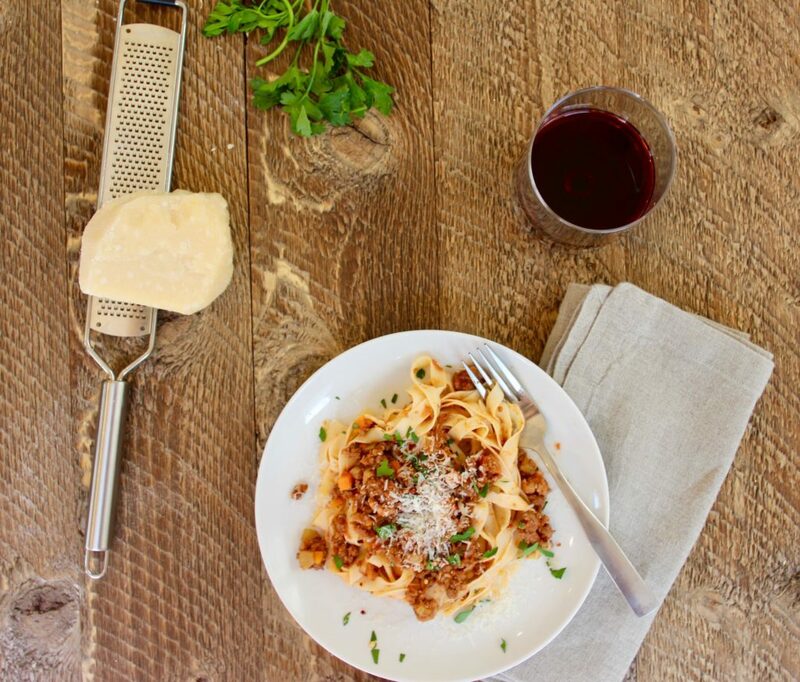 But at home, we prefer to use our Stand Mixer and our Pasta Roller and Cutter Set. 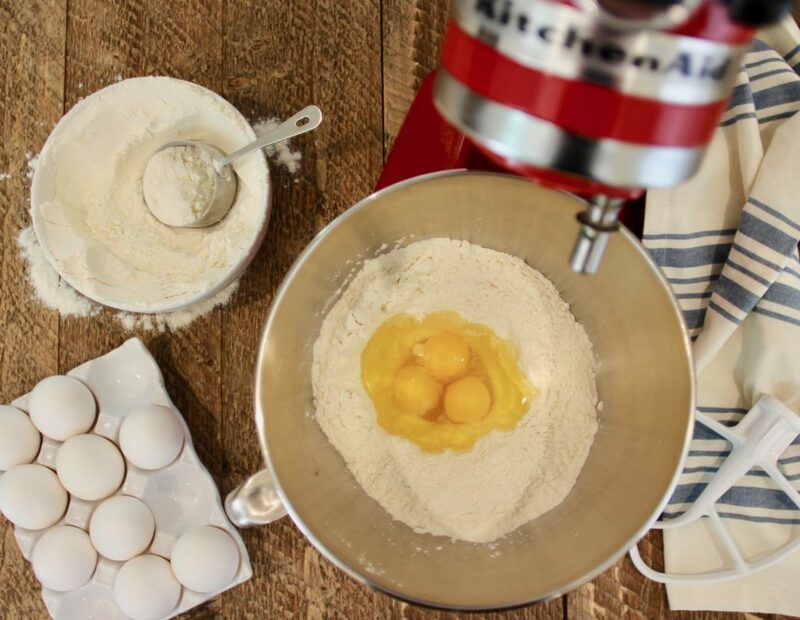 The mixer allows you to easily throw together a batch of pasta dough. 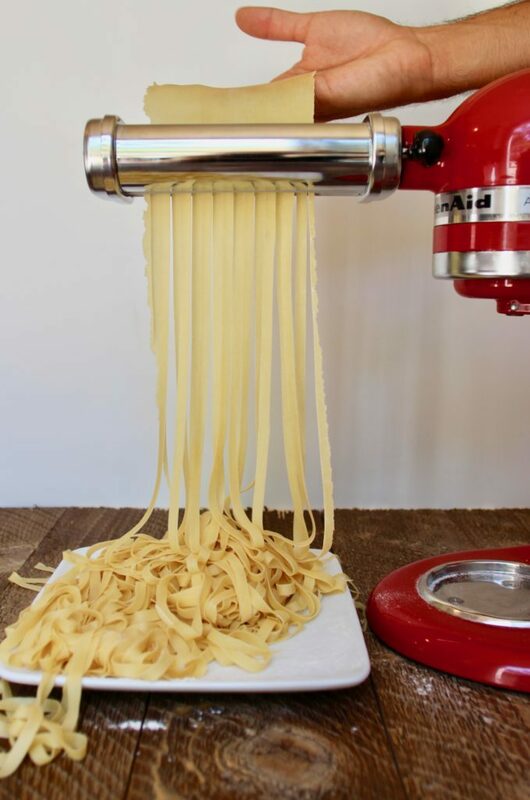 Meanwhile, the pasta roller flattens out your dough into very thin sheets and the pasta cutter slices your dough into whatever noodle type you want, such as spaghetti or fettuccine. Making your pasta dough by hand is a lot more labor intensive and takes a lot longer. However, there is something to be said for making pasta the traditional way, like we learned to do in Italy! To make the dough by hand, you’ll simply follow the recipe below to make the dough. Then you’ll roll it out — getting your pasta sheets as thin as you can — and cut noodles into your desired width with a pizza cutter or a knife. 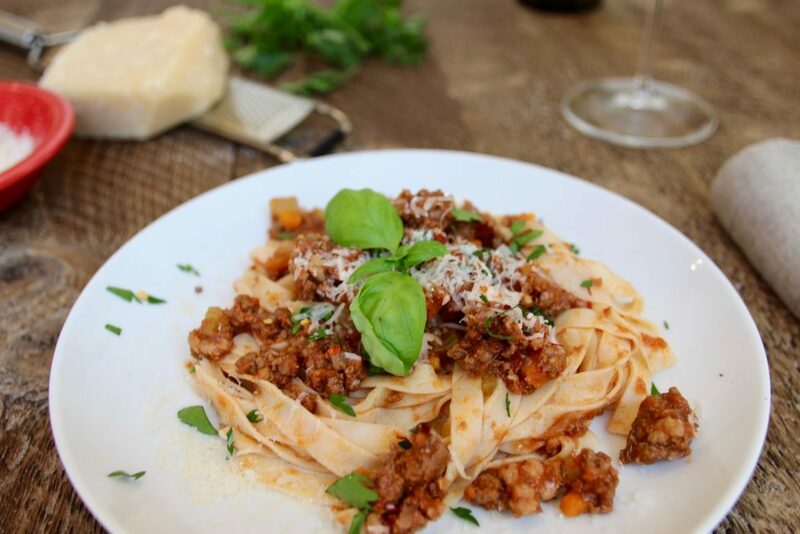 Are you ready to try out this authentic homemade pasta recipe? Let’s do it! First, in your mixer bowl, add in the “00” flour and create a well in the middle of the pile with your hand. Then, crack your eggs into the well, along with your salt and extra virgin olive oil. Next, attach your paddle to your mixer and set it to the lowest speed. 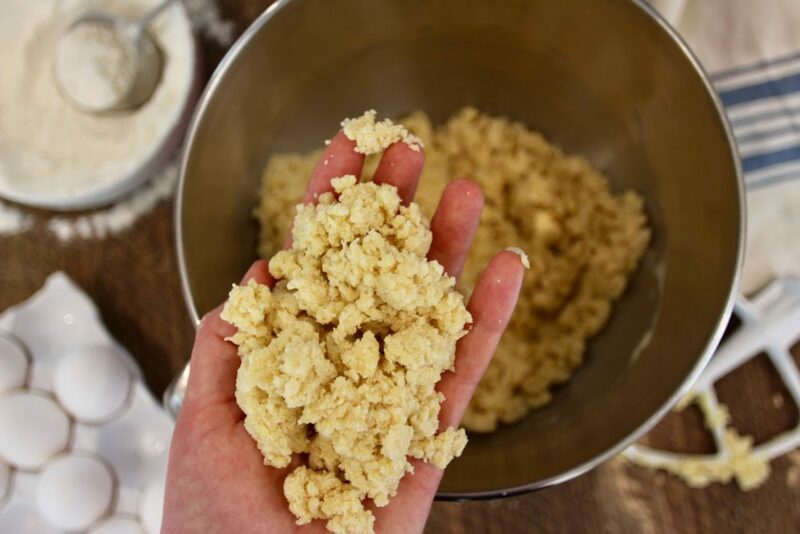 Turn on your mixer and run it until the ingredients incorporate and the dough comes together into small, sticky clumps — such as in the photo above. Next, gently knead the dough with your hands for about 10 minutes. Add flour to your work surface as needed, to ensure your dough does not stick. Once your dough is smooth, form it into a ball and tightly wrap it in plastic wrap. Then place it in the refrigerator to chill for 15 minutes. Next, take your dough out of the refrigerator and cut it into three even pieces. Insert your pasta roller onto your mixer and set the mixer to the lowest setting. Then, turn your mixer on and run the dough through the pasta roller. Start with setting #1 — the widest setting — and continue the process through setting #8 — the thinnest setting. By the end of the process, your pasta sheets will be thin enough to start cutting! Next, remove the pasta roller from your mixer and insert the pasta cutter of your choice. Then, simply turn your mixer on to the lowest speed, and feed your pasta sheets through the cutter! Your pasta sheets will come out the other end as beautiful, fresh noodles, and you’ll hardly be able to contain your excitement. Cook your Pasta and Eat it! All that’s left to do is boil your noodles, mix them into your sauce, and eat it all up! To cook your pasta, simply bring a pot of salted water to a boil, and then cook your pasta until it rises to the surface and is al dente. This shouldn’t take more than two or three minutes. Then, let the feast begin! See that?! 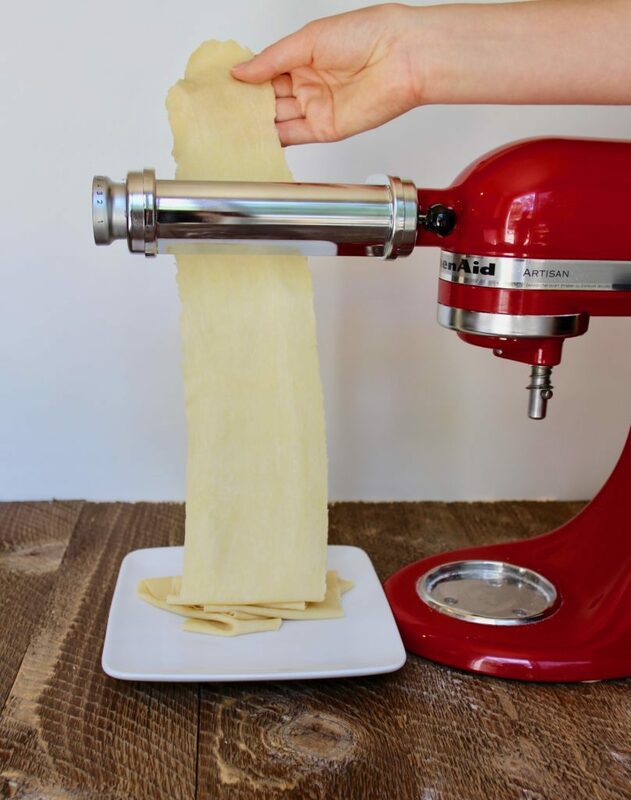 Making pasta from scratch, in the comfort of your own kitchen, couldn’t be simpler — especially with a Stand Mixer and Pasta Roller and Cutter Set. Just make sure to pick up (or order) “00” flour first! Learning to make this pasta in Italy spoiled us forever. 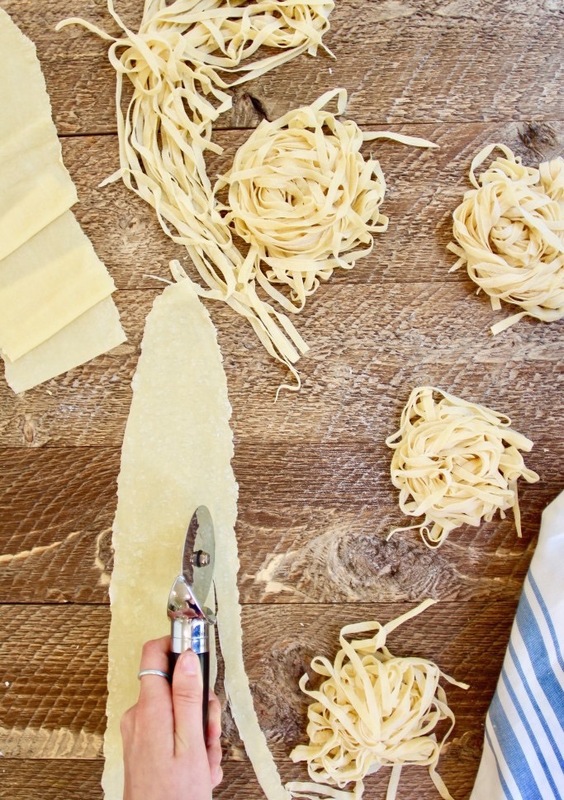 Now, nothing but fresh, homemade pasta makes the cut, because it’s so much better than anything you can buy at the grocery store. And the good news is that it doesn’t take much time or effort to whip up a fresh batch of your own delicate, delicious pasta. So what are you waiting for?! Put a huge smile on your face by loading up on some homemade Italian-style carbs. Buon appetito! If you're ready to take your pasta dishes to the next level, store-bought pasta just isn't going to cut it. 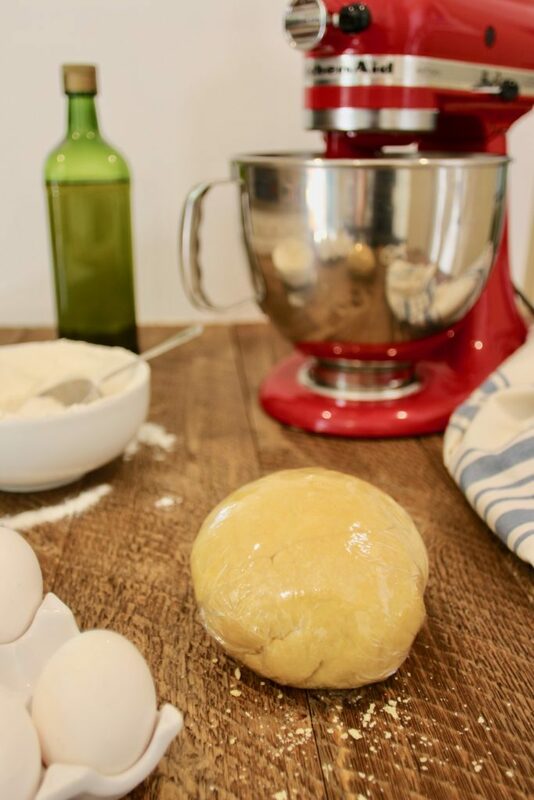 In this post, we detail exactly how to make pasta from scratch, with or without a stand mixer, pasta roller, and pasta cutter. Here's our authentic homemade pasta recipe, which we learned during a cooking class in Florence, Italy! Buon appetito! In your mixer bowl, add in the "00" flour and create a well in the middle with your hand. Crack your eggs into the well, along with your salt and extra virgin olive oil. Attach your paddle to your mixer and set it to the lowest speed. Mix until the ingredients incorporate and the dough comes together into small, sticky clumps. Gently knead the dough with your hands for about 10 minutes, until smooth. Add flour to your work surface as needed, to ensure your dough does not stick. Remove your dough from the refrigerator and cut it into three even pieces. Replace the mixer paddle with the pasta roller. Set the mixer to the lowest speed and turn it on. Run each piece of dough through the pasta roller. Start with setting #1 -- the widest setting -- and continue the process through setting #8 -- the thinnest setting. Remove the pasta roller and insert the pasta cutter of your choice. Turn your mixer on to the lowest speed, and feed your pasta sheets through the cutter. To cook the pasta, boil a pot of salted water, and cook the pasta until it rises to the surface and is al dente -- about two or three minutes. Combine your freshly cooked pasta with a sauce of your choice and enjoy! If you're making pasta without a stand mixer, pasta roller, and pasta cutter, refer to the parenthetical, italicized directions in the blog post above! Did you try out this homemade pasta recipe? Let us know how it went in the comments below, and tag us (@travelalphas & #travelalphas) in your foodie photos! Yum!! Nothing beats homemade pasta (except maybe homemade bread). Gorgeous photos! 1) I would make it early in the day and cook it for dinner, what is the best way to store the fresh pasta until I’m ready to cook it? 2) Is it best to dry it on a pasta hanger or store it soft until ready to cook? 3) And would the storing be different if I wanted to cook it a few days later? You can let the pasta dry on a hanger for 30-60 minutes, then form into nests, wrap tightly, and refrigerate. You can leave the pasta in the fridge for a few days. Any longer, and you should freeze it. Mine stuck together! How do you keep it from doing this? Very Nice! I need to get up the ambition to make my own pasta—it’s so much better than the dry stuff. Love how you have recipes sprinkled throughout your travel blog. One of my favorite things about travel is the way it transforms how I make food at home. Great post!